Biotechnology applications of magnetic gels include biosensors, targeted drug delivery, artificial muscles and magnetic buckles. These gels are produced by incorporating magnetic materials in the polymer composites. A biocompatible magnetic gel film has been synthesized using polyvinyl alcohol. The magnetic gel was dried to generate a biocompatible magnetic film. Nanosized iron oxide particles (γ-Fe2O3, ~7 nm) have been used to produce the magnetic gel. The surface morphology and magnetic properties of the gel films were studied. The iron oxide particles are superparamagnetic and the gel film also showed superparamagnetic behavior. Magnetic gel made out of crosslinked magnetic nanoparticles in the polymer network was found to be stable and possess the magnetic properties of the nanoparticles. Polyvinyl alcohol (PVA) is a unique synthetic biocompatible polymer and it has a large number of hydroxyl groups that can react with many kinds of functional groups. Apart from its different industrial uses, it is widely being used in sensors and in drug delivery system [1, 2]. Ferrogels made with PVA can mimic artificial muscle . Synthesis of PVA magnetic fiber which can be used as magnetic paper, health care cloth or electromagnetic wave absorbent has been recently reported . Here we report a synthesis of a PVA magnetic film generated from PVA magnetic gel. This film can be useful as sensors in biomedical applications. We used a two step synthesis process for generating the magnetic gel . 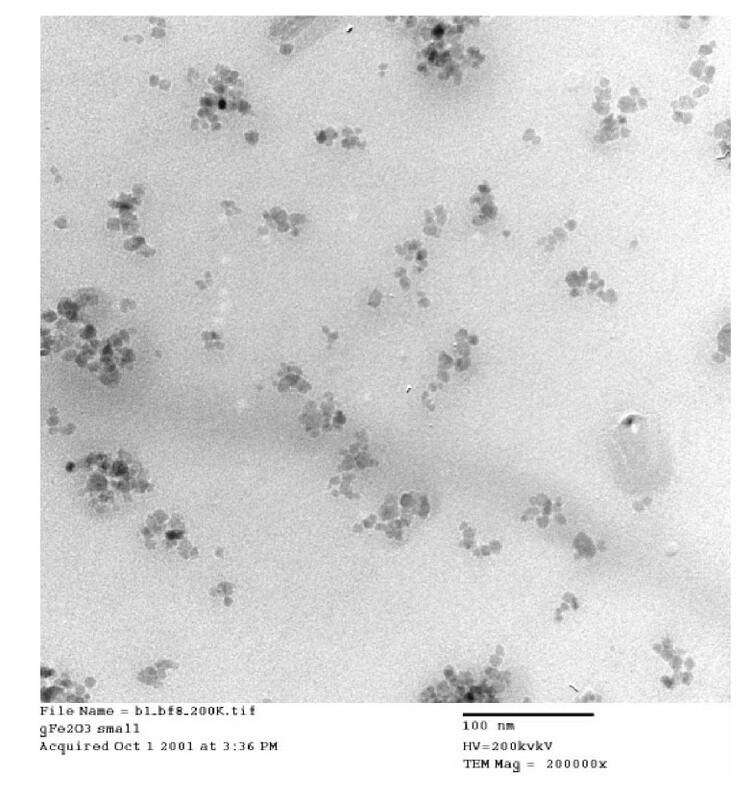 Nanosized iron oxide particles (γ-Fe2O3, ~7 nm) have been used to make the magnetic gel. The magnetic gel was dried to generate biocompatible magnetic films of different thicknesses. The surface morphology and magnetic properties of the gel films were also studied. The iron oxide particles are superparamagnetic and the gel film also showed superparamagnetic behavior. Polyvinyl alcohol polymers (Mw = 25,000 and 125,000) were obtained from Polysciences, Inc. Gluteraldehyde and nitric acid were obtained from Sigma Chemical Company. A two-step process was used to form the magnetic gel film. In the first step, surface modified nanosized maghemite was synthesized. The second step was the formation of composite materials. Maghemite was formed by conventional coprecipitation process  using ferrous chloride and ferric chloride in 1:2 molar ratios. We have used ultrasonication along with coprecipitation process. Later on the surface of the maghemite was modified with a cationic surfactant, cetyldimethylethylammonium bromide . In the second step different concentrations (2–5%) of two different polyvinyl alcohol polymers (Mw = 25,000 and 125,000) were made in water. The surface modified maghemite was then added in different weight proportions (20–50% of the weight of polymer) and sonicated at 50% amplitude for 30 s. Glutaraldehyde was used as crosslinking agent (at slightly acidic pH, about 6) using 1 M nitric acid. Formation of gel occurred almost immediately. The crosslinking density was varied by using different amounts of glutaraldehyde. The gels were formed in rectangular aluminum trays and dried. The gels were dried till they formed a film of constant weight ensuring the absence of water. The size and the shape of the surface modified maghemite particles were determined by transmission electron microscopy (JEOL STEM 2010). 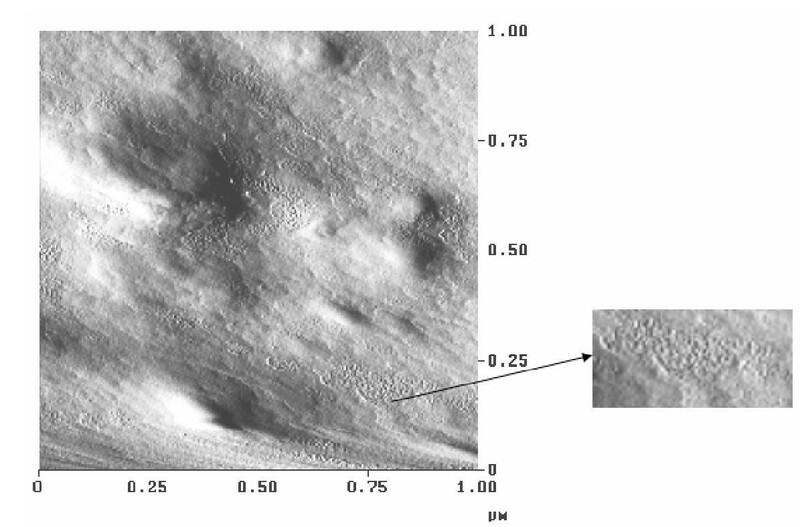 The micrograph is shown in Fig. 1. The particles are in the size range of 7 – 10 nm and have fairly uniform distribution. These particles are superparamagnetic in nature as reported earlier . The surface property of these gel films was studied by atomic force microscopy. A thin film was put on a glass slide to observe under the Atomic force microscope (D 3000, Digital Instruments, Santa Barbara). 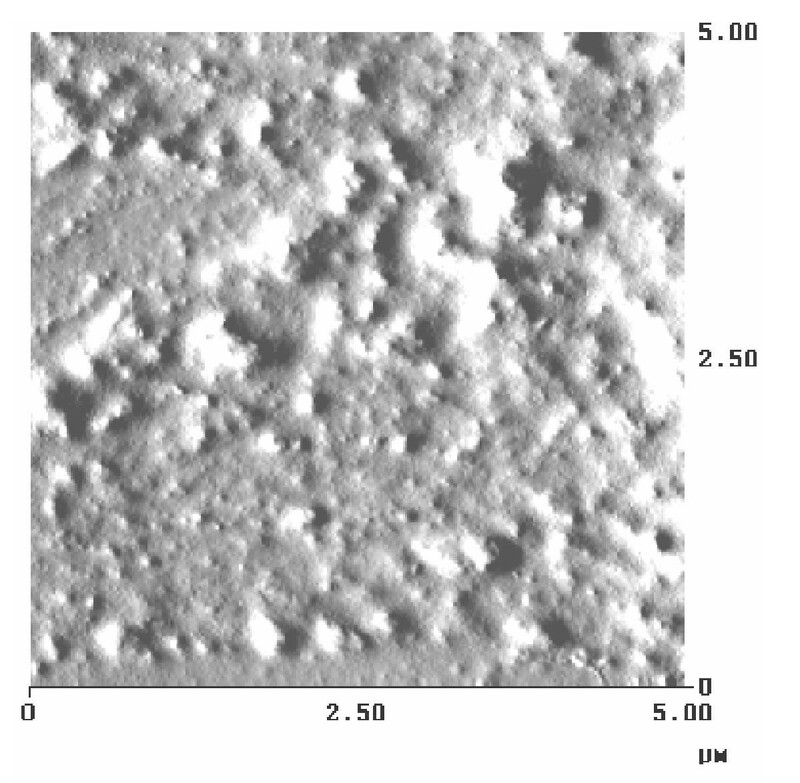 PVA film formed lamellar structures as observed in the micrograph (Fig. 2). Crystalline structure must have formed in the gel itself though it was not clearly observed when microscopy was done on a gel sample and it showed a globular and porous structure along with contrast due to the presence of maghemite in them. The surface of the gel film shows the presence of iron oxide particles in the matrix as observed in the AFM micrograph (Fig. 3). The magnetic property of the gel was measured by a Superconducting Quantum Interference Device (MPMS 5, Quantum Design). Magnetization measurement was done at 300 K and at 5 K. A small piece of PVA magnetic film was placed in a gelatin capsule and inserted in the SQUID. 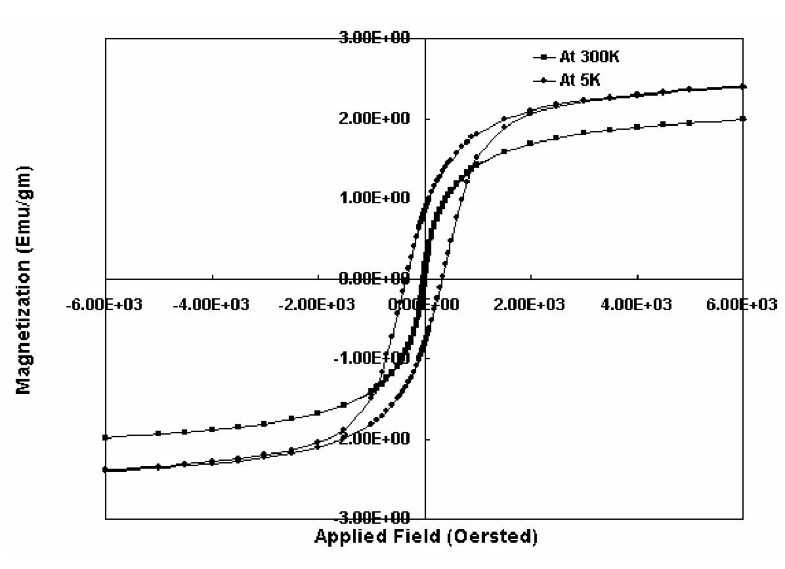 There is almost no remnant magnetization at 300 K but at 5 K, hysteresis loop was observed (Fig 4). This shows that the superparamagnetic nature of the nanosized maghemite particles [7, 8] did not change in presence of the polymer network and the composite film itself behaved as a superparamagnetic material. A biocompatible magnetic film has been generated from the gel. As a crosslinked gel forms a three dimensional network the film formed from is expected to have more tensile strength than the solution cast films. This gel film can be considered as a composite material with superparamagnetic property. The work was sponsored by a grant from the Center for Materials Research and Technology (MARTECH) at Florida State University. JC conducted the experiments to synthesize of the PVA magnetic film, characterization of the film by electron microscopy and magnetometry and prepared the manuscript. YH supervised the study and planned for the write up of the whole study in the form of an article for publication. CJC reviewed the manuscript and overall evaluation of the paper. All authors read and approved the final format of the paper.